No more nice-guy nonsense about history. It’s time to learn it the horrible way. Forget the yawnsome bits and check out the nasty bits. It’s historically funny! Meet the Angry Aztecs: a Mexican tribe with a real knack for being totally gross. Gruesome gods. Seriously savage warriors. Terrible temples where freaky Aztec priests ripped out human hearts. Even their ball games came to a bloody end. This is history with extra nasty bits! Very funny, history with the nasty bits left in, lol. Everyone should read it. best way to learn history! Terry is a former actor, theatre-director and Drama teacher and currently lives in County Durham. He has written over 150 books in the UK, including 44 Horrible Histories titles, and was voted the fifth most popular living children’s author in a 2005 Guardian survey. Terry Deary won the 2001 Blue Peter Prize for Rotten Romans. Martin Brown was born in Australia but currently lives in Dorset. 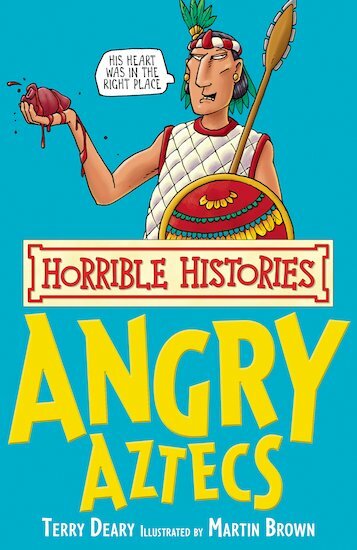 In 1993, he illustrated the first of the HORRIBLE HISTORIES, and has now contributed to more than 60 titles in the series.